It’s that time again, long hours back at school, lugging books around and taking notes for those lackluster classes. So now, you are busier than ever and always on the go. You’re scrambling to put an ounce of makeup on in the morning but realize you don’t have time, you throw what you can into your school bag and later realize the worst has happened. Instead of bringing items to brighten your makeup-less face, you brought a bronzing brush with no bronzer and a foundation too dark for your skin tone. To help you with this daily dilemma, we’ve put together a list of items perfect for an on-the-go look. Keep these items in a school bag, in your car, or even in a locker for a quick touch up and you’ll never have to scramble for makeup again. First, you’ll need a makeup bag. On Amazon we found this N. Gil Large Travel Cosmetic Pouch Bag big enough to store all your products while small enough to throw in a bag. Once you have your bag, it’s time to fill it with all of the necessities! 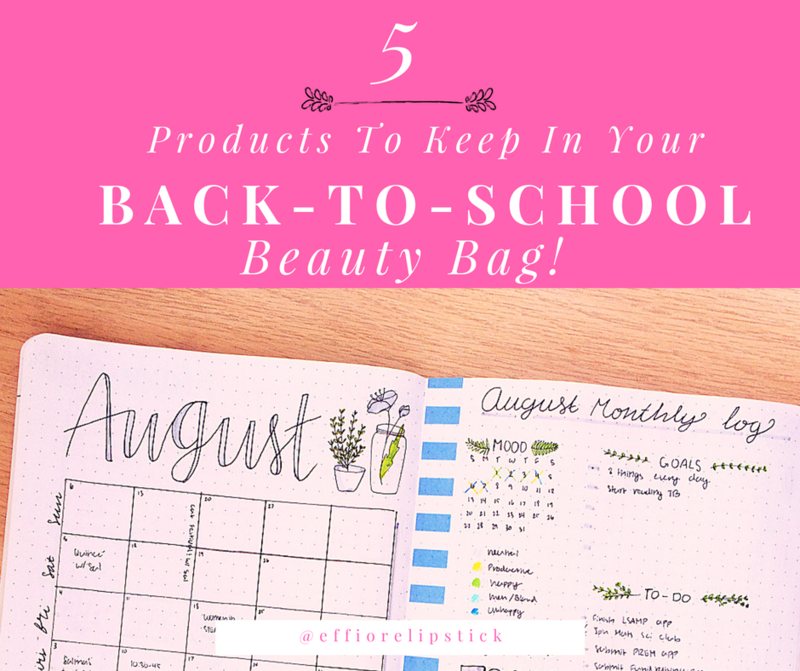 We recommend adding 5 products to your beauty bag that will ease your busy lifestyle. Makeup Forever’s Pro Finish Multi-Use Powder Foundation is a compact that includes a mirror and a sponge, easy for applying your foundation on-the-go. A concealer that is really easy to apply is Maybelline’s Instant Age Rewind Eraser Dark Circles Treatment Concealer. Just swipe and blend with the applicator and you are good to go! effiore is a must for on-the-go beauty. Since it has a natural tint you can apply this to your lips and swipe it on your cheeks for a little burst of color. effiore is a unique lipstick. 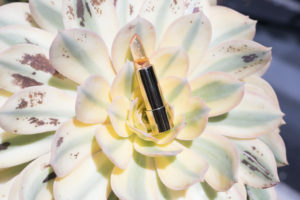 It is a clear jelly lipstick that has a flower and gold flecks in it making you feel glam anywhere you are. effiore’s floral jelly lipstick adapts to your skin tone and temperature to match any makeup look. Plus, it’s super cute! You choose, lipstick with flower, or without. The choice is easy. Tarte’s Play Face Shaping Pallet is an all-in-one bronzing, highlighting and eye pallet. There is no need to carry all separate items with this on-the-go item. Remember to add a double-ended makeup brush, this makes it simple to apply eyeshadow and bronzer. It Cosmetics Heavenly Luxe Complexion Perfection Brush No. 7 is perfect for using an all-in-one pallet. This one is up to you, you can add a travel sized mascara, eyeliner, and brow pencil in your beauty bag to amp up your back-to-school look. Adding a little makeup can brighten your spirits on some of the busiest school days! Even just swiping on a little jelly floral lipstick can give you the confidence you need to ACE that test!